No matter what Dez was doing, purple was always a part of it. Whether on his clothes, briefing slides, or as the symbol for "jointness" in DOD terms it was always present when he was around. 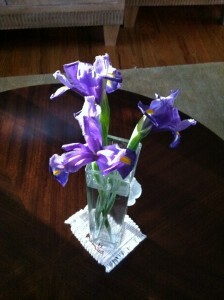 Since he passed a year ago, my wife and I have made an effort to keep purple flowers in the house as a reminder. I first met Dez in October 2001 when I was interviewed for a contract job at National Defense University’s newly created Center for Technology and National Security Policy (CTNSP). A couple weeks later I started a new assignment there, and spent the next three years working with him and Joe Eash on a program designed to provide early warning of state failure and assist policy-makers in building coalitions for early action and assessing policy options. While I entered NDU with a strong skepticism of formal models and concerns over what I regard as a misguided effort to predict what is fundamentally unpredictable, Dez put me at ease with his emphasis on thinking about the international system and policy itself in evolutionary terms. By shifting the analytic emphasis from outcomes in the international system, to processes for how policy-makers might discover vulnerabilities and opportunities, I could see how the models played a role in individual and group learning and were not undeservingly endowed with powers and properties they do not possess. Instead they were simultaneously the engines and artifacts of analysis, revealing how people and organizations learned, what they knew, don’t know, and wanted to know. This perspective largely distinguished Dez from others in the defense community who were seeking to develop tools and methods for analysts coping with a variety of complex problems, ranging from the challenges of counterterrorism and counterinsurgency, to the proliferation of Weapons of Mass Destruction, to economic and political development, to straight up geopolitics. Whereas most modelers emphasized the sophistication of their algorithms or quantity of data the tools could process, Dez always looked beyond that by focusing on the kinds of information that could be extracted with the aid of computation and wondering what role technology could play in policy processes. For him, it was about exploiting what could be discovered in a way that fit into organizational processes and patterns of decision-making. Surprisingly, this often meant that predictions were far less relevant to the needs of organizations than uncovering the range of what was possible and identifying and articulating alternative frameworks for thinking about choices and consequences. Simply put, Dez always wondered how models could provide insight and alternatives in support of robust decision-making based on the belief that uncertainty was a permanent feature of the system, rather than commit to improving the predictive accuracy of a model under the assumption that uncertainty could be eliminated with more data, theory and computation. In his mind, being overcommitted to prediction reflected epistemological naiveté about the world of policy-makers, politics in general and human agency—a perspective that I wholeheartedly share. Dez started out at as a client, and later transitioned to my boss, but he was always first and foremost a friend. This was most evident during our years together at BAE Systems. Throughout this period, Dez always maintained a positive attitude, despite the difficulties of being focused on social science and policy research inside of an organization that was primarily an information technology company, which was itself acquired by a large aerospace engineering firm. Indeed, he was so positive that we often argued about the fact that he didn’t worry enough—where I saw dragons lurking he saw little more than annoying gnats. Despite earning the nick-name “mini-me” (a truly ironic title given that we came from wildly different circumstances, and had inverted personality types among other differences), others did not realize the extent to which Dez and I were often engaged in intellectual and combat, particularly on organizational and project matters. Nevertheless, our friendship was never strained and he always encouraged me to pursue things in whatever manner I thought was best. For example, when placed in a difficult position on a project, Dez encouraged me to put the client ahead of all other concerns and stood by me throughout the corporate fall-out that resulted. Likewise, there were a couple of occasions where I entertained other opportunities that would have meant leaving the organization and he never tried to dissuade me from taking them—instead, he spent uncountable hours helping me think through the challenges and opportunities that other jobs might have provided. He was always willing to provide advice, and his professional and personal interests always took a back seat to our friendship. In fact, he was so keen on not imposing his will on his colleagues that conversations with Dez were often like talking with Yoda—with each question answered by another question, a laugh and smile. After leaving BAE for new opportunities, Dez and I found ourselves working together again on a new project developing of a series of models, teaching materials, and a handbook for analysts introducing them to the ideas behind ABM and the design and use of models in general. As fate would have it, this project would be our last together. While Dez had started drafting a handbook, he ultimately fell ill and passed away before its completion. I left the modeling side of the project in order to complete the handbook in his absence. At this time, the handbook is mostly completed, a complete manuscript in need of an editor’s touch. I think about it daily, and can’t help but imagine how much better and different it would be had Dez been able to complete it—while all of his ideas are present, his unique vision and charm is somehow missing from the pages. As I write this, I realize that I still cannot express the extent of my sadness over his absence. At the time of his passing, we were entering into our tenth year of working together and I was looking forward to the next ten with great excitement. It is encouraging and sad to see that much of our concerns about modeling and policy, complexity, and more have started to permeate the policy community, e.g. the conference at IIASA that I attended over the summer or the report by Richard Danzig published last month all reflect a changes consistent with his thinking. I’m encouraged that others, and certainly those with a greater wealth of experience and expertise to draw on than I, see what Dez saw and tried to address so many years ago. I’m sad that he isn’t here to see the small victories that these efforts represent, and sense that his vision and unlimited energy would turn them into larger ones if he was still with us. Thank you for capturing the nuanced personality, brilliance and energy of of Dez. I recall debating with Dez on some of the finer points of computable general equilibrium modeling and its tradeoffs. As I sat around my Thanksgiving table, I remembered how much his passing has impacted both me and our ICAP community. You are not alone in your grief. Our thoughts and prayers go out to his family and two young children. Though I didn’t know him that well, Dez was truly one of a kind, a shining light. Thanks for explaining what it was like working with him and how much it affected you, Aaron.